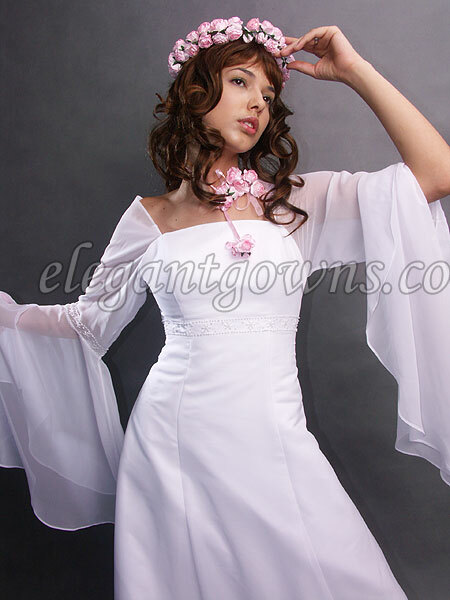 For Your Renaissance Wedding Theme! If you are the type of bride who loves the whole nostalgic romantic fairytale medieval era, and you want your wedding to standout as a unique experience... then the renaissance wedding theme is the way to go! You really can have fun with this theme! You may choose to have just yourself and the groom dress for the period or include your wedding party. What will really make your wedding special is... if you invite your guest to dress the for the wedding theme also. Think of the fun and the memorable pictures you will have of your wedding day! What are the popular fashion trends used for medieval wedding gowns? Empire-waist, A-line, dropped waist, and ball gown silhouettes with full gathered skirts. Corseted lace up front or lace up back gowns. V-neck, square necklines and modified sweetheart necklines. Sleeve styles that characterize this period are juliet sleeves, elizabethian sleeves, bell sleeves and poet sleeves. The short puff sleeve was popular also during this period. The fabrics can be heavy tapestry type fabrics, satins, brocades or velvets. 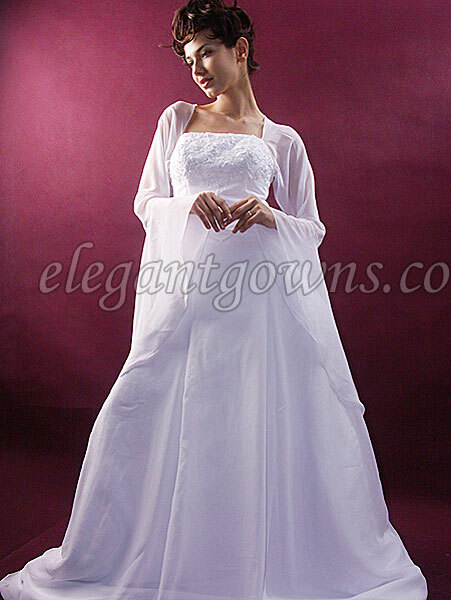 Or the fabric can be light and airy chiffon, georgette and voile. When it comes to colors authentic medieval celtic wedding dresses were not white or pastel. They were made in deep colors like red, green and blue. 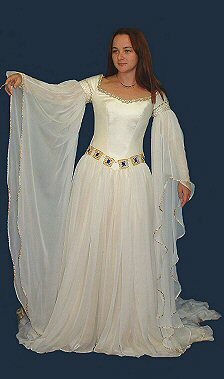 But a medieval inspired wedding gown can be white or ivory. On thing you have to decide is how authentic do you want to go with the attire for your wedding. Are you going to stay true to the period of time or are you looking for a medieval inspired look with a modern touch. If you want something authentic to the time period remember the medieval time frame covered several centuries. That means you will have to research the century of time, and the class status of the time period that you want to emulated. There were two distinct classes, those who were among the nobility and those who were among the peasant class. Your wedding dress and wedding party attire should reflect one or the other. Also since you are going after being true to the time period... you will more than likely be looking at purchasing a costume. You would have to seek out a source that specializes in the renaissance time period. If you are going for the medieval fairytale wedding gown look... you can find modern wedding dresses that have celtic or gothic styling. 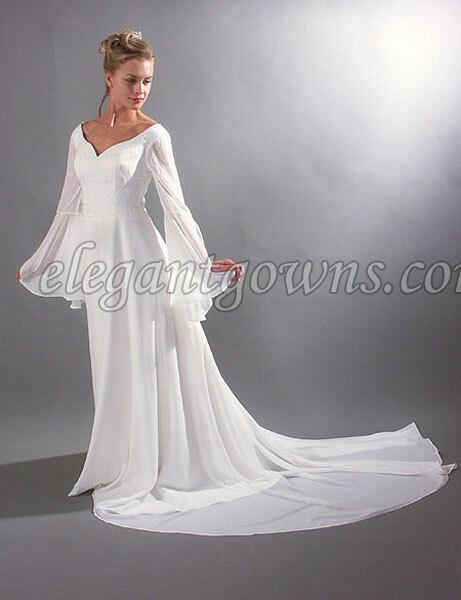 There are some styles with the poet sleeves, empire waist or the lace up bodice front or back. Another thing you could do is to have a dressmaker custom design and make your wedding gown. If authenticity is a factor, it would be best to choose a sewing professional who specializes in making costumes for the period of time you want your dress designed from. This may be an expensive way to go in order to get the dress of your dreams, but you certainly have full control over the design and the details of the gown when you have it custom made. And the custom fit can't be beat! Where Can You Find Medieval Fairytale Wedding Gowns? 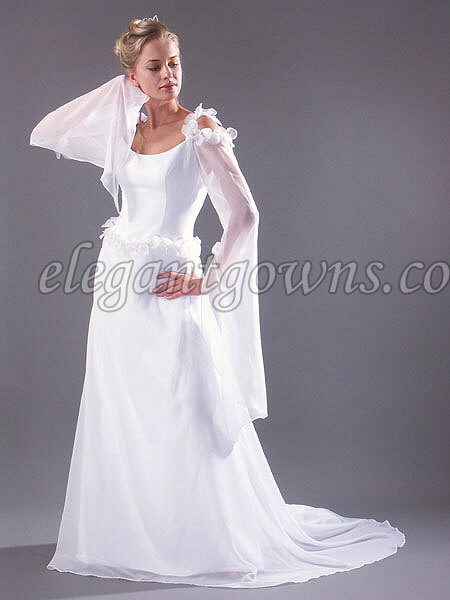 There are a few sites that specialize in medieval bridal gowns. But if you look through some wedding dress designers' collections, you can find some modern bridal gowns styled to look like renaissance wedding dresses. But if you want something crafted specially for you or a shop that specializes in renaissance wedding gowns, most of the sources are located in the UK. But don't worry most of the online shops will ship to the US. I found this message board called Medieval and Renaissance Wedding Board. It has a lot of information about wedding planning for a medieval wedding. On the board there is a tread listing resources for Medieval Fairytale Wedding Gowns.